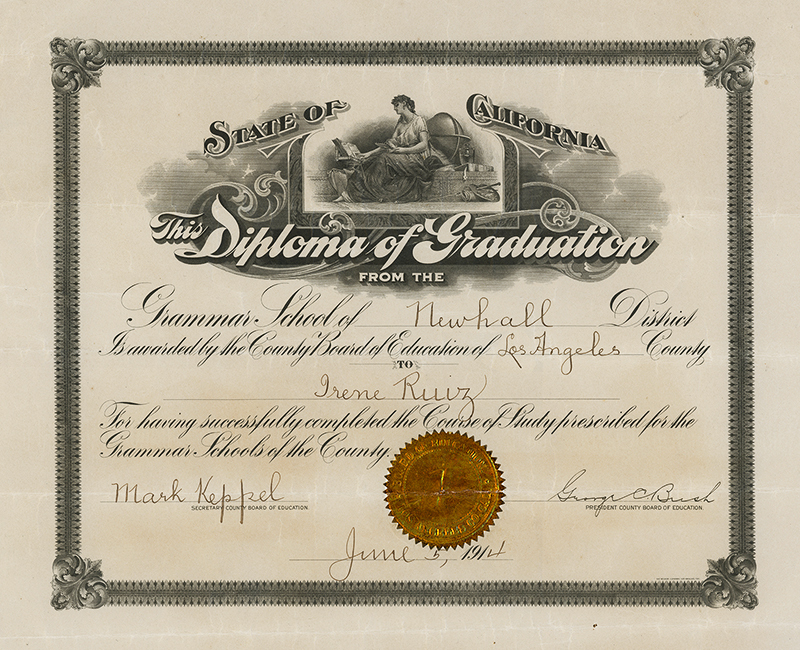 SCVHistory.com RL1401 | Newhall Schools | Irene Ruiz's Newhall Grammar School Diploma, 1914. 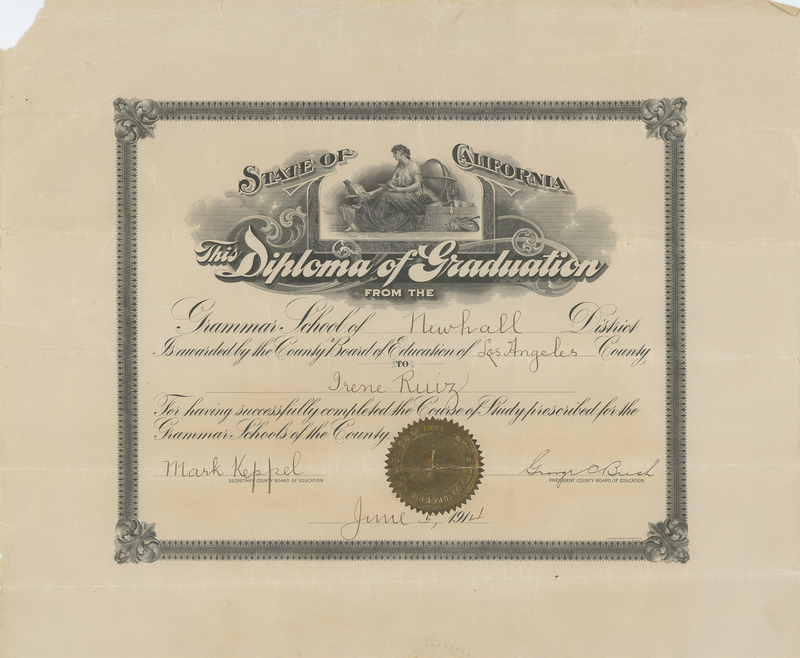 Irene Ruiz (McKibben's) Newhall Grammar School diploma, June 5, 1914. Diploma measures 14x17 inches. Some of the border area has been cropped in this view. Click on the image to see the full border. For having successfully completed the Course of Study prescribed for the Grammar Schools of the County. At the time, Newhall School was located northwest of Newhall Avenue and 10th Street (Lyons). The modern address is 24514 Kansas Street. Irene Ruiz (1898-1995) and her sister Rose were the natural children of Newhall innkeeper Martin R. Ruiz, who died Feb. 26, 1900. After his death, his widow married Nicanor H. "Nick" Rivera, who took over the saloon and raised the two young girls. Nick and his new bride had at least two more children — Arthur Rivera, who is younger than his two half-sisters in this photo; and Lucy Rivera, who is also younger as noted in this ~1915 Newhall school photo. Lucy Rivera is the mother of the contributor of this photo/diploma, Rosie Luce of Porterville, Calif.
Nick Rivera (b. Feb. 8, 1865), was killed Oct. 17, 1926. According to news reports, he was riding his horse in San Fernando when he was struck by a car. The driver was initially held for manslaughter but apparently was freed; Rivera's descendants refer to his death as a "murder." Both Martin R. Ruiz and Nick Rivera are buried in the Ruiz-Perea Cemetery in San Francisquito Canyon. Irene married Ivan "Mac" McKibben. Her sister Rose married Ted Fosterling. It should be noted that there were at least three Martin Ruizes in the area in the late 1800s-early 1900s. No. 1 is Irene's father, the aforementioned Martin R. Ruiz, b. March 6, 1868. No. 2 is the Martin Ruiz who owned the Suraco adobe in Bouquet Canyon before the Suraco family owned it. This was her father's father, also named Martin Ruiz. No. 3 is Martin F. Ruiz, who died in the St. Francis Dam Disaster on March 13, 1928. He was born Oct. 10, 1908, eight years after Irene's father's death. Perhaps Martin F. would have been nephew to Martin R.; we don't know the exact relationship between Martin R. and the family of Enrique and Rosaria Ruiz who perished in the flood. Clearly there was one, as they are buried in the same family cemetery. 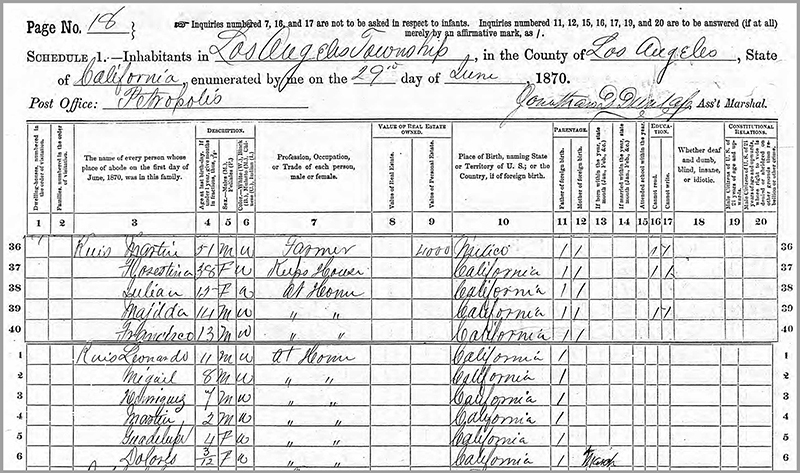 Ruiz family, 1870 U.S. Census. Click image to enlarge. RL1401: 9600 dpi jpeg from original diploma courtesy of Nick Rivera's granddaughter, Rosie Luce of Porterville, Calif.